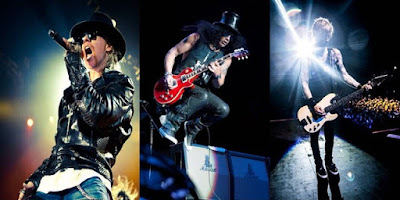 hennemusic hennemusic: Guns N’ Roses reunion tour to expand beyond North America? Guns N’ Roses reunion tour to expand beyond North America? The Guns N’ Roses reunion tour may be expanding beyond its original soon-to-be-announced North American dates. Guitarist Billy Duffy of The Cult shared some breaking news about the GNR trek with Vanyaland ahead of their show in Boston, MA next week. It’s unclear at this point if Duffy is referring to a pair of concerts in Mexico City in April or if he’s aware of an overseas schedule that has yet to surface. Guns N’ Roses will launch the 2016 tour at the new T-Mobile Arena in Las Vegas, NV on April 8 & 9. The band have confirmed plans for a summer tour of North America by way of a video announcement featuring a list of the 21 cities they’ll hit along the way. Further information regarding dates, venues and tickets is expected to be announced soon.